Analytica's Intelligent Arrays are central to its power and convenience. Whether you are a spreadsheet expert, or used to building models in other simulation tools, or computer languages, like Visual Basic, R, Python, you may find Intelligent Arrays take a little getting used to. But, once you get the key concepts, you will find them tremendously powerful and convenient. So, even if you usually ignore manuals, we suggest that you look through this page. It introduces the key concepts of indexes and arrays with a simple example. 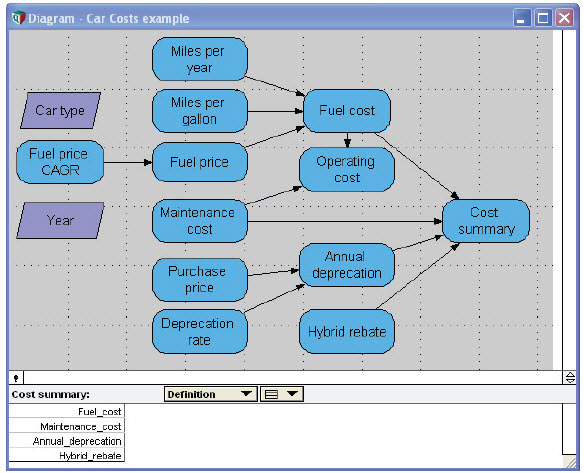 It shows how to build a simple model to compare the costs of three automobiles. An Index identifies a set of options, often used as a dimension of an Array. 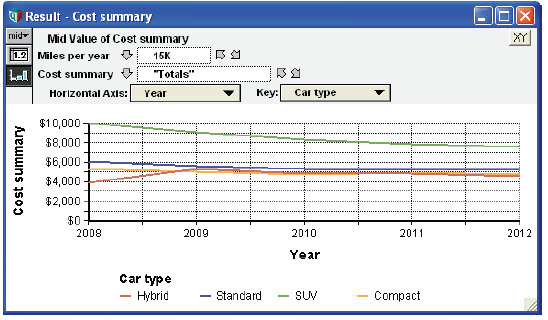 Suppose you want to compare the fuel cost of three different vehicles, each with different fuel efficiency. We start by defining an index Car_type, which lists three different types of cars as text values. You create a new index, like any new variable, by dragging an index node from the node menu. Once you have created the new node, type in a title Car type. Show its definition attribute in the Attribute pane below the diagram, and select List of Labels from the expr menu. Then type the car type the first care type as Standard. Press Enter to add the next cell. Type in Hybrid, and SUV (Sports Utility Vehicle) as two more cells. Now the Car_type is ready to use as an Index for tables, including Edit tables containing input values, and results wiht a value for each each Car type. 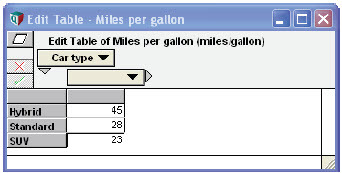 Create a new variable by dragging it from the node menu, and typing a title Miles per gallon. Draw an arrow from the index Car type to the new node so that you can create a table with numbers for each Car type. By default, diagrams don't show arrows to or from index nodes (after you have drawn them.) That's because each index is often used by many other variables. So showing all the arrows tends to clutter up the diagram. But, you can see them if you want. Open the Diagram Style dialog from the Diagram menu, and check Show arrows to/from Indexes . 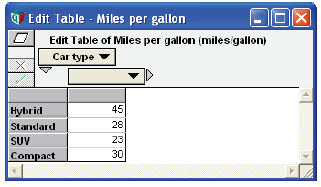 In the attribute panel above, we show the definition of Miles_per_gallon, and select Table from the expr menu. This opens the Indexes dialog to let you choose which index(es) to use for the table dimensions. It starts with Car_type as the selected index because you drew the arrow from it (see Indexes dialog). Click OK to accept. An edit table appears, indexed by Car_type, with cells initialized to 0. You can now edit the cells of the table. Type in a number for each Car_type. This completes the edit table for Miles per gallon. 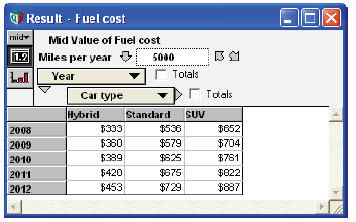 Now let’s calculate the annual fuel cost for each car type. 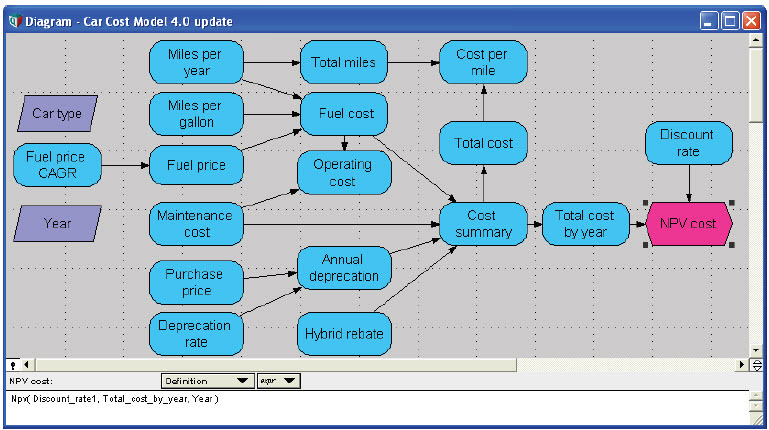 We create three new variables, Miles_per_year, Fuel_price, and Fuel_cost and draw the arrows. 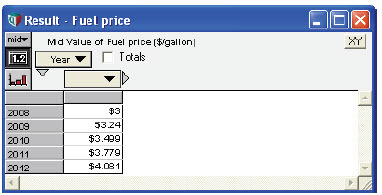 Select Fuel_cost and click the Result button to show this result table. 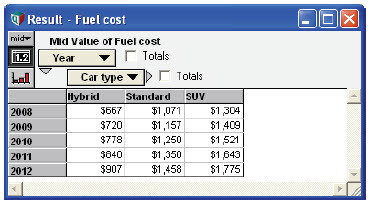 This result for Fuel_cost was computed using Miles_per_gallon for each Car_type, and the single a number, 3.00 for Fuel_price and 10K for Miles_per_year. The arithmetic operators * and / work when one or both operands are arrays, just as well as when they as when they are single number – also known as an atom or scalar . The same is true for +, -, and ^. This is an example of array abstraction, central to Intelligent Arrays™. Now let’s add in the maintenance costs. We create a new variable Maintenance_cost, defined as an edit table, based on the Car_type index, just as we did for Miles_per_gallon. Now let’s add another index, Year, so that we can extend the model to compute the costs for multiple years. We create the new index as before. In its definition we enter 2008..2012, to specify the start and end year. This expression says that Fuel_Price starts at 3.0 in Year 2008 (when the exponent (Year - 2008) is zero. For each subsequent year, we raise (1 + 8%) to the power of the number of years from the start year, 2008— i.e., standard compound growth. Here’s the result. Click the graph icon to view this as a graph. Now look at Fuel_cost. Its has three inputs, Miles_per_year, which is still a single number, 10K, Miles_per_gallon, which is indexed by Car_type, and Fuel_price, which is now indexed by Year. The result is a two-dimensional table indexed by both Car_type and Year. It contains every combination of Miles_per_gallon by Car_type and Fuel_price by Year. This illustrates a general rule for Intelligent Arrays: The result of an expression contains the union of the sets of indexes of the elements (operands). Pivot a table, exchanging rows and columns: In the table above, it shows Car_type down the rows and Year across the columns. To pivot the table — i.e., exchange rows and columns — select the other index from the menu defining the columns (or the rows). Unlike other computer languages, with Analytica, you don’t need to worry about the ordering of the indexes in the table. 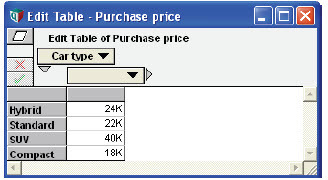 Rows and columns are simply a question of how you choose to display the table. They are not intrinsic to the internal representation of an array. Maintenance costs also changes over time, so we need to add Year as dimension. Simply draw an arrow from Year to Maintenance_cost. When it prompts “Do you wish to add Year as a new index of the table in Maintenance_cost?” click Repeat Values. Now open the edit table for Maintenance_cost. It has added Year as a second dimension, copying the number for each Car_type across the years. Notice that it shows the same values for each Year, following the rule that a value is constant over a (previously) unused index. Now you can edit these numbers to reflect how maintenance cost increases over time. 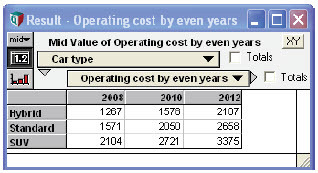 Let’s look at the value of Operating_cost again. Since its inputs, Fuel_cost and Maintenance_cost, are both indexed by Car_type and Year, the result is also indexed by those two indexes. Each cell contains the sum of the corresponding cells from the two input variables. The diagram now looks like this. Even though Miles_per_year is not defined as an index node, it becomes an implicit index. 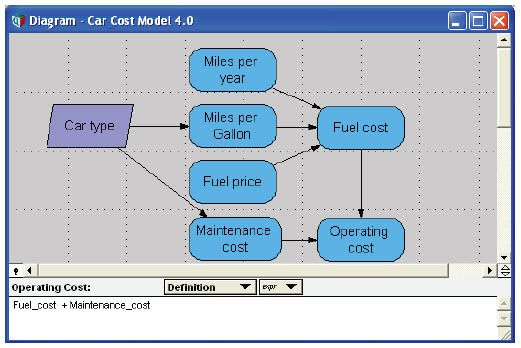 This is an example of model behavior analysis, described in Parametric analysis. Now all three inputs to Fuel_cost are one-dimensional arrays, each with a different index. Its result is a three-dimensional table, computed for each combination of three input variables, so indexed by Miles_per_year, as well as Year and Car_type. The new third index, Miles_per_year, appears as a slicer index, initially showing the slice for 5000 miles/year. 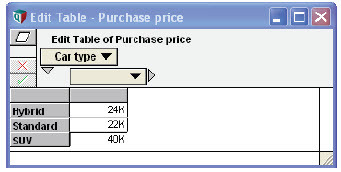 You can click the down-arrow for a menu to choose another value, or click the diagonal arrows to step through the values for miles/year. See Index selection. You can also pivot a table to display, for example, the Car_type down the rows and Miles_per_year across the columns, for a selected Year in the slicer. 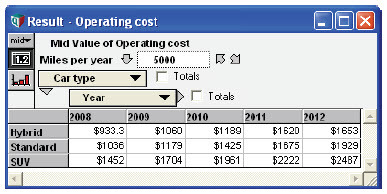 When we look at Operating_cost again, it also now has three dimensions. Again the result has the union of the indexes of its operands. It is the sum of fuel cost and maintenance cost, each of which is indexed by Car_type and Year as before, but now Fuel_cost has the third index, Miles_per_year. The result contains all three dimensions. Note how each time we add an index to an input variable, or change a variable, e.g., Miles_per_year, to be a list of values, the new dimensions automatically propagate through the downstream variables. The results have the desired dimensions (the union of the input dimensions) without any need to modify their definitions to mention those indexes explicitly. We mention the index Year, over which we want to calculate the sum. But, we do not need to mention any of the other indexes of the parameter Operating_cost. The built-in function Sum(x, i) is called an array-reducing function, because it reduces its parameter «x» by one dimension, namely «i». There are a variety of other reducing functions, including Max](x, i), Min(x, i), and Product](x, i) (see Array-reducing functions). These functions explicitly specify the index over which they operate. Since they mention it by name, you don’t need to know or worry about any ordering of dimension in the array. You can list the indexes in any order since you identify them by name. Again you don’t need to remember which dimension is which. This is called name-based subscripting syntax, in contrast to the more conventional sequence-based subscripting. In addition to absolving you from having to remember the ordering, name-based subscripting generalizes flexibly as you add or remove dimensions of the model. To complete the model, let’s add the Purchase_price, an edit table indexed by Car_type (just as we created Miles_per_gallon). It calculates this formula for each Year, raising (1 - Depreciation_rate) to the power of the number of years from 2008. It calculates the expression for each value of the indexes, in this case Year and Car_type, with this result. The subexpression Year = 2008 returns an array indexed by Year containing 1 (true) for 2008 and 0 (false) for the other years. 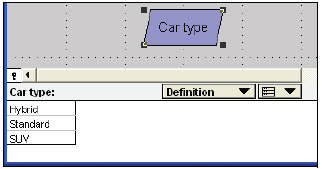 Subexpression Car_type = 'Hybrid' returns an array indexed by Car_type, containing 1 (true) for 'Hybrid' and 0 (False) for the other Car_type. Therefore, the expression Year = 2008 AND Car_type = 'Hybrid' returns an array indexed by both Year and Car_type, containing 1 (true) only when both subexpressions are true, that is 1 for Hybrid in 2008 and 0 for the other cells. The entire IF expression therefore returns -2000 for the corresponding top-left cell and 0 for the others. Now draw an arrow from each of the four variables you want to view to Cost_summary, in the sequence you want them to appear. Each time you draw an arrow into a variable defined as a list, it automatically adds that variable into the list. (If the origin variable was already in the list, it removes it again.) 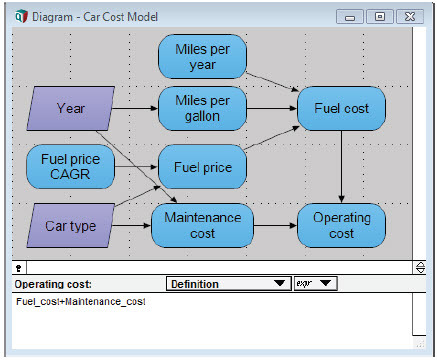 Here is the diagram showing the resulting definition for Cost_summary. This diagram does not display arrows from index nodes to avoid confusion with crossing arrows. We switched these off by restoring Show arrows to/from Indexes to unchecked (the default) in the Diagram style dialog from the Diagram menu. The resulting definition is a list of variables. The result for Cost_summary is four-dimensional, adding a new index, also labeled Cost_summary, showing the variables in the list. An array that does not contain index «i» as a dimension is treated as though it has the same value over each element of «i» when there is a need to expand it to include «i» as a dimension. Totals in a table: To see the total over the costs and over the Years, check the two Totals boxes next to the row and column menus. The new index containing the titles of the four cost variables in the list is also called Cost_summary. Thus, the identifier Cost_summary serves double-duty as an index for itself. This is known as a self index, and can be accessed using the IndexValue() function. As before, we need to specify the index over which we are summing, Year, but we don’t need to mention any other indexes, such as Car_type and Miles_per_year, which are irrelevant to this summation. 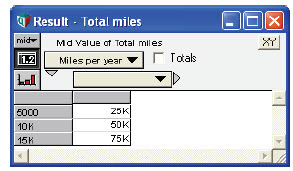 Note that Miles_per_year is not indexed by Year. The principle of Constant value over unused indexes implies that Miles_per_year has the same value for each Year. Hence, the result is the miles per year multiplied the number of years, in this case 5. What if you want to extend this model to include Compact as a fourth Car_type? Open one of the edit tables indexed by Car_type, say Miles_per_gallon. Click the last Car_type, SUV, to select that row (or column), and press Enter or the down-arrow key. It says “Changing the size of this index will affect table definitions of other variables. Change data in tables indexed by Car_Type?” This warns that adding a new Car_type will affect all the edit tables indexed by Car_type. Click OK, and it adds a new bottom row, with the same label SUV as the previous bot- tom row, and with value 0. Double-click the index label in this bottom row, and type the new Car_type, Compact, to replace it. Then enter its value, say 30 (miles/gallon). Now open the edit table for Maintenance_cost, and you will see a new row for Compact already added, initialized to 0 in each cell. You just need to enter numbers for Maintenance_cost for the Compact car, as shown here. Next enter numbers for the Maintenance_cost for the Compact car. Then enter a purchase price for the Compact car. Now you’ve entered the data for Compact Car_type into the three edit tables, you’re done. All the computed tables automatically inherit the expanded index and do the right thing — without you needing to make any change to their definitions. For example, Cost_summary now looks like this. 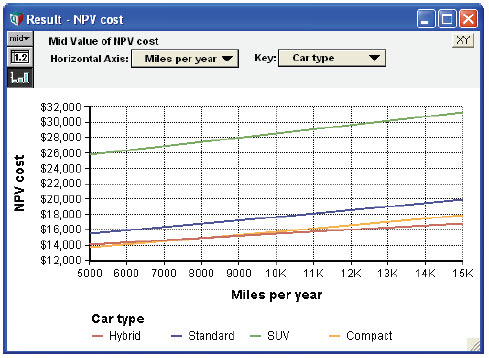 Here is the final diagram, showing NPV_Cost. Almost any variable in Analytica can be uncertain — that is, probabilistic. Each probabilistic quantity is represented by a random sample of values, generated using Monte Carlo (or Latin hyper- cube) simulation. Each random sample is an array indexed by a special system variable Run. The value of Run is a sequence of integers from 1 to Sample_size, a system variable specifying the sample size for simulation. For most operations and functions, Run is just another index, and so is handled just like other indexes by the Intelligent Arrays. You can see it when you choose the Sample uncertainty view. In other uncertainty views, such as Mean or CDF, the values displayed are computed from the underlying sample. See Uncertainty views. As we developed this simple model, we refined it by adding indexes progressively. First, we defined Car_type, then Year, and finally we changed Miles_per_year from a single value to a list of values for parametric analysis. 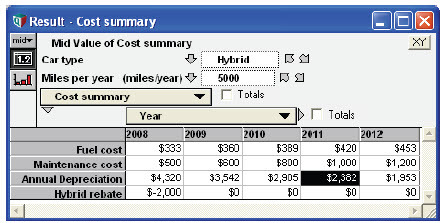 Creating Cost_summary added a fourth index, consisting of the four cost categories. It is often a good idea to build a model like this — starting with a simple version of a model with no or few indexes, and then extending or disaggregating it by adding indexes — and also sometimes removing indexes if they don’t seem important. This approach to development is sometimes called progressive refinement. By starting simple, you get something working quickly. Then you expand it in steps, adding refinements where they seem to be most useful in improving the representation. A more conventional approach, trying to implement the full detail from the start, risks finding that it’s just too complicated, so it takes a long time to get anything that works. Or, you might find that some of the details are excessive — they just weren’t worth the effort. Progressive refinement is a much easier in Analytica than in a spreadsheet and most other computer languages — where extending or adding a dimension requires major surgery to the model to add subscripting and loops. With Intelligent Arrays, to extend or add an index, you only need to change edit tables or definitions that actually do something with the new index. The vast majority of formulas generalize appropriately to handle a modified or new dimension without needing any changes. Analytica’s Intelligent Arrays make quite easy what would be very challenging in a spreadsheet or in a conventional computer language which would force you to add loops and subscripts to every array variable every time you add a dimension. If you find yourself using a lot of subscripts or For loops (see For and While Loops), you are probably not using Intelligent Arrays properly. Take the time to understand them, and you should find that you can greatly simplify your model. Omit irrelevant indexes: An expression need not mention any index that it does not explicitly operate over. A value is constant over unused index: Any function or expression that operates over an Index «i» on a value «x» (atom or array), which does not have «i» as a index, treats «x» as constant over «i» -- i.e. as if it had the same value «x» for each value of «i». Rows and columns are features of displayed tables, not arrays: You can choose which index to show down the rows or across the columns, or as a slicer dimension. You (almost) never need to think about about the order in which indexes are used in an array. When the expression contains an array-reducing function or construct, such as Sum(x, i) or x[i = v], the result will not contain the index «i» over which it is reduced. When the expression creates an index, the result will also contain the new index. In other words, you get the same result if you select element «k» of index «i» of array «x» and then apply F() as if you first apply F() to array «x» and then select element «k» of index «i» of the result. This turns out to be an extremely powerful principle. It underlies Analytica's array abstraction which lets you define expressions on arrays without needing to do explicit iteration over each index as you would need in conventional computer languages. The vast majority of operators, constructs, and functions fully support Intelligent Arrays — that is, they generalize appropriately when their operands or parameters are arrays. A few do not, notably the sequence operator (..), Sequence() function, and While loop. When you use these, you need to take special care to ensure that your models perform array abstraction conveniently when you add or modify dimensions. For how, seeEnsuring Array Abstraction.